(ii) The actual neutral axis lies above the critical neutral axis (n < nc). (iii) The percentage of steel is less than the balanced section hence the section is economical. (v) The moment of resistance is less than balanced section. In under reinforced section, the failure is ductile because steel fails first and sufficient warning is given before collapse. Due to ductile failure and economy, the under-reinforced sections are preferred by designers. (i) Concrete is fully stressed while steel is not (i.e., the stress in concrete is at its permissible value σcbc but stress in steel is less than σst). (ii) The actual neutral axis is below the critical neutral axis i.e., n > nc. (iii) The percentage of steel is more than the balanced section, so the section is uneconomical. 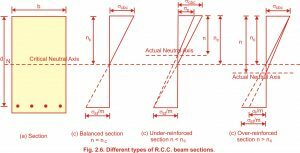 An under-reinforced beam is one in which the tension capacity of the tensile reinforcement is smaller than the combined compression capacity of the concrete and the compression steel (under-reinforced at tensile face). When the reinforced concrete element is subject to increasing bending moment, the tension steel yields while the concrete does not reach its ultimate failure condition. As the tension steel yields and stretches, an “under-reinforced” concrete also yields in a ductile manner, exhibiting a large deformation and warning before its ultimate failure. In this case the yield stress of the steel governs the design. An over-reinforced beam is one in which the tension capacity of the tension steel is greater than the combined compression capacity of the concrete and the compression steel (over-reinforced at tensile face). So the “over-reinforced concrete” beam fails by crushing of the compressive-zone concrete and before the tension zone steel yields, which does not provide any warning before failure as the failure is instantaneous.